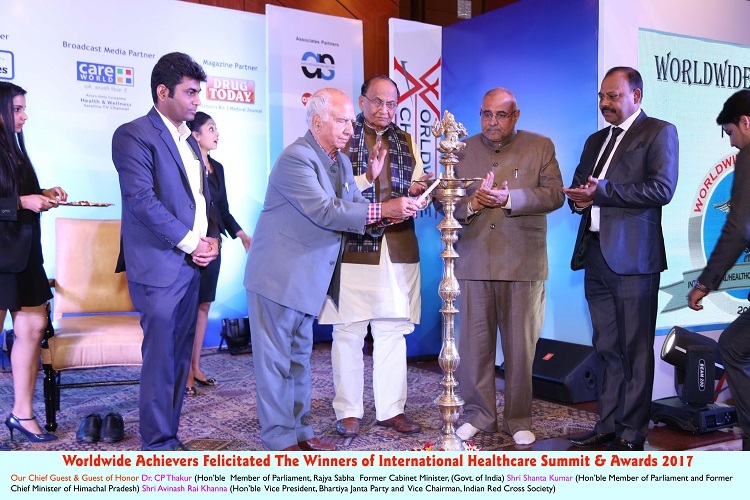 Worldwide Achievers organized International Healthcare Summit & Awards 2017 association with CARE WORLD TV as Media Partner and Drug Today Medical Times as Print Media Partner held on 06.12.2017 at New Delhi, Ceremony to felicitate across India’s top Doctors, Clinics & Hospitals, Healthcare Providers, Nursing Homes, Medical Devices and Hospital Equipment Companies, Diagnostic Laboratories, Medical Educational Institutions, Nursing Training Centers, Health Insurance Companies. INTERNATIONAL HEALTHCARE SUMMIT– Aims at felicitating organizations and individuals for their contributions to the industry by innovating for increased efficiency and improved performance of healthcare delivery at large. The Worldwide Achievers Awards have emerged as the most credible and coveted in the industry within a short span of time. The main purpose of the summit is to focus on healthcare sector. The theme of the summit is revolved around various topic: Latest in treating Neurological Disability/ Cancer/ Cardiac Disease/ Kidney Disease, Innovation in Healthcare Delivery Systems, Healthcare Tourism and Medical informatics in India, One of the pressing issues in the country- Affordability of Healthcare Challenges in Rural Areas, Government Policies and Healthcare Management. The awards were based on a comprehensive market research study and opinion surveys conducted by Worldwide Achievers. Shri Shanta Kumar (Hon’ble Member of Parliament and Former Chief Minister of Himachal Pradesh), Dr. C.P Thakur (Hon’ble Member of Parliament, Rajya Sabha and Former Cabinet Minister Govt. of India) and Shri Avinash Rai Khanna (Hon’ble Vice President, BhartiyaJanta Party and Vice Chairman, Indian Red Cross Society) and R Sathiyasundaram (DCP- Security, Delhi Police) were the Chief Guest & Guest of Honor at the gala ceremony and gave away the award certificates & trophy to the winners which included Individuals/organizations from all across India. Worldwide Achievers is a dynamic global analytical company providing research, analysis and rating services. We are leading Market research & rating company in India. We have been providing state of the art market research, rating and analysis for organizations of all sizes. We are also the foremost provider of high-end research to the world’s largest leading industry. With sustainable competitive advantage arising from our strong brand, unmatched credibility, market leadership across businesses, and large customer base, we deliver analysis, opinions, and solutions that make markets function better. We are experienced and qualified practitioners of both Market and community research our directors have strong expertise in market research, advertising, Public relations, brand management, retail sales and operations, franchising and event management improvement, encompassing a true passion for business of our clients.